Each year, SMART gives away over 140,000 new books for students to keep and read with their families. In programs around the state, participating PreK through third-grade students select two books each month to keep, helping them build their personal libraries and foster a love of reading. Providing books is a key component of our program model because research shows that the presence of books in the home is a critical factor in early literacy development. In fact, children with access to 25 books at home will, on average, complete two more years of school than children from homes without any books at all. Our partner schools have high populations of children from low-income households, and studies show that these children are less likely to have books in their homes. Providing them with two books each month is our way of addressing the need for increased access to books. 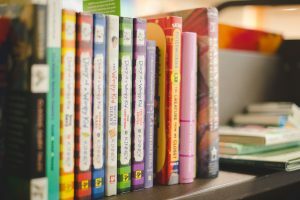 SMART uses a child-guided approach to literacy, in which children have the opportunity to select the books they want to read with their adult volunteer, as well as those they take home to share with their families. Read on to learn more about the types of books we provide, our process for book selection, and how you can help us put new books in the hands of kids!